Linda Gambrell has spent many dedicated years in the world of reading- beginning her journey as a public school teacher, then becoming a reading specialist, to then serving as the president for three leading professional reading organizations. Gambrell currently teaches undergraduate and graduate courses in literacy at Clemson University. 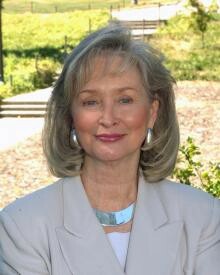 Gambrell is a member of the Reading Hall of Fame and has won many prestigious awards regarding her vast contributions to the field of reading. One of Gambrell's major areas of research has been on the topic of getting students intrinsically motivated to read. As a teacher, I see students who choose to pick up a book and who truly "get lost in the story". They would tell you they love to read! Unfortunately though, I also see students who have not quite found that passion for reading. These students would choose to complete another worksheet before they open up a book. Gambrell has helped me become a teacher who motivates all children to read. Teachers and schools differ on their incentive philosophy for reading books. For example, some teachers praise students for the number of books read while others reward the amount of minutes read. 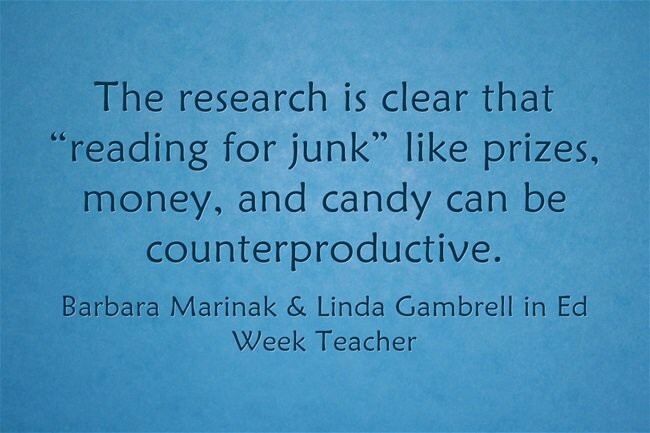 However, how much good are teachers really doing to inspire our students to read by giving an extrinsic reward, just as a candy bar or toy? According to an article by Gambrell, "Through well intentioned, extrinsic incentives and rewards can actually serve to undermine the desired effect of nurturing intrinsic reading motivation" (Schunk, Pintrich, and Meece 2008). Are all rewards bad then? Gambrell found one teacher who helped to influence her idea of rewarding students for good reading skills. "In this classroom the teacher used primarily intangible extrinsic rewards... For example, after a reading skill group where all children were able to demonstrate mastery, she rewarded the students with 10 extra minutes of free reading time" (Gambrell, "BUT THAT: Using the ARC of Motivation"). 1. Access- Provide a wide range of reading materials as well as time throughout the day to read and discuss books. 2. Relevance- Reading materials and activities that students engage in need to based on students' interests and desires. 3. Choice- Students need to be allowed choice in what they pick up to read. However, above all else, as the teacher we need to show our students how much we love to read and how it is a lifelong skill! As Gambrell noted, "One of the key factors in motivating students to read is a teacher who values reading and is enthusiastic about sharing a love of reading with students" (Gambrell, "BUT THAT: Using the ARC of Motivation"). *Students' self-concepts and the value they place on reading are critical to their success. As teachers, we need to be emphasizing the importance of reading and modeling that desired behavior to our students. Gender differences also play a role here as boys tend to value reading less than girls. How can work to have boys just as motivated? (Gambrell & Marinak, 2009). *Choice is widely acknowledged as a method for enhancing motivation. We need to allow our students choice frequently throughout each day so that students feel ownership in which books they're choosing to pick up. This helps to increase their interest in what they're reading as well as their level of commitment and effort. *Read-aloud and discussion are effective ways to engage in mastery modeling. According to McGee & Richgels (2003), teacher read alouds can be used to promote deeper understanding and interpretation of text; allow children to take an active role in understanding text; and prompt children to begin using mental activities that will become automatic as they begin reading independently. *Providing balanced book collections at all grade levels is vital to engagement. This includes lots of nonfiction materials since this was the preference of genre for most kindergarten and first graders. *Many schools, teachers and parent organizations use rewards in their reading programs. Although incentives for reading are highly debated, some rewards, such as a new book, may encourage more reading to occur with students. We need to be very careful here though when using incentives in our classrooms. In summary, the research shows that if we want motivated readers, we must offer our students multiple opportunities that include "choice of activity, social collaboration with peers, appropriate levels of challenge, and experiences of successes" (Morrow, 2009). There are multiple ways to do this each day in our classrooms whether it's by learning about our students' interests and making sure books and print materials are available to them on that topic or using reading as a reward instead of handing out rewards for reading. Offering choice for a teacher read aloud means students can feel like they have a say and they will then be more open to listening and participating in discussions. Gambrell, L. B & Marinak, B. (2016). Section 2: WHY NOT? WHAT WORKS? What we know about reading motivation and what it means for instruction. No more reading for junk: Best practices for motivating readers. Heinemann Educational Books. Gambrell, L. B & Marinak, B, (2009). Reading motivation: what the research says. Retrieved from http://www.readingrockets.org/article/reading-motivation-what-research-says. 2014 Kentucky Reading Association Conference. In their own words: Dr. Linda Gambrell [Video file]. Retrieved from https://www.youtube.com/watch?v=KEPFkPmuy8w. Gambrell, L. B & Marinak, B. (2016). Section 3: BUT THAT: Using the ARC of motivation to engage all readers. 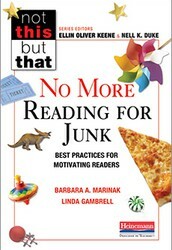 No more reading for junk: Best practices for motivating readers. Heinemann Educational Books. Gambrell, L. B & Morrow, M. M (2015). Best practices in early literacy. In best practices in literacy instruction (pp.85-126). New York: The Guilford Press.